Built at the end of the 19th century by St Matthew’s Church in Brixton, the centre was originally known as St Matthew’s Parochial Hall. It was part of the Church of England and was used by the church to reach poor parishioners. In 1966, it was purchased by The St Vincent de Paul Society (SVP) and became a club for the deaf in the 1970s. More recently, and prior to its closure in January 1997, the building was a community centre under the chairmanship of Father Charles Walker, a Roman Catholic priest. The mission of the centre shared the principles of the SVP in seeking to alleviate poverty. In 1996, following the retirement of Father Walker, the SVP decided to sell the building and take it out of community use. The building remained on the market for 18 months, during which time lack of maintenance led to further deterioration. There had been strong local resistance to the closure within the community, with petitions and letters to the SVP. 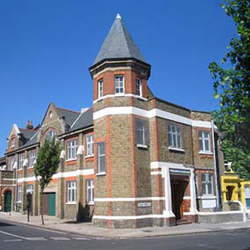 In December 1998, a management committee was formed by local people and the SVP was approached formally to allow the building to remain a community centre. After submitting a Business Plan to SVP Trustees, agreement was finally reached for the building to be managed on a license, eventually leading to the granting of a long term lease which was signed in 2003. Since then, we have been steadily refurbishing the centre.